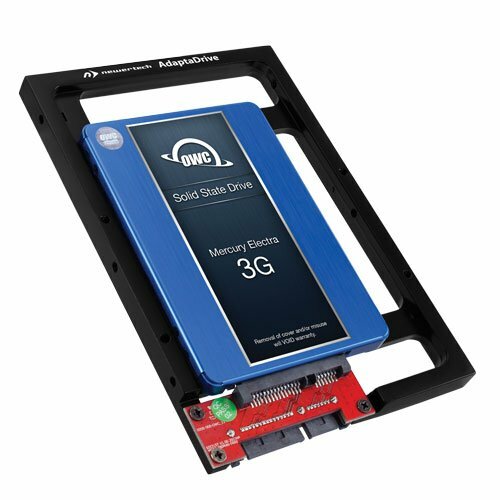 DIY Bundle: OWC Mercury Electra 3G SSD and NewerTech AdaptaDrive. A 2.5" Drive for your 3.5" Drive Bay. Experience the extreme performance of an OWC SSD upgrade with this easy DIY AdaptaDrive and Mercury Electra 3G Kit. AdaptaDrive enables you to install the high-speed Mercury SSD in an available 3.5" SATA drive bay in moments, delivering phenomenal transfer speeds and outstanding reliability.With sustained reads up to 285MB/s and writes up to 275MB/s, up to 100X greater data protection than enterprise class Hard Disk Drives, and RAISE technology for RAID like data protection and reliability, the OWC Mercury Electra 3G SSD line delivers unbeatable performance, that's backed by a 3 Year OWC SSD Limited Warranty. The NewerTech AdaptaDrive has been benchmark test proven to deliver the same data transfer rates as is experienced when a drive is connected directly to the SATA data bus. The AdaptaDrive doesn't create a bottleneck or any performance throttling...it delivers pure data pass-through performance and drive use convenience from any 2.5" SATA 1.5Gb/s, 3Gb/s, or 6Gb/s hard drive or SSD. AdaptaDrive Specification: NewerTech Part Number: ADPTADRV; Drive Interface: Fully SATA Revision 3.0 (6Gb/s) compatible, SATA Revision 2.0 (3Gb/s) and 1.0 (1.5Gb/s) compatible; Drive Supported: 1) 2.5" SATA 6Gb/s drive. Mercury Electra 3G SSD Specifications: Capacity: 120GB useable; SandForce SF2181 processor; Tier-1 synchronous MLC NAND flash storage, SATA Revision 2.0 (3Gb/s) compliant, Supports SATA Revision 3.0 (6Gb/s) and 1.0 (1.5Gb/s); RAID 0/1/10/0+1 and SPAN; Sustained Reads: 285MB/s, Sustained Writes: 275MB/s; 7% over provisioning, ECC recovery: up to 55 bytes correctable per 512-byte sector, Nonrecoverable read errors: less than 1 sector per 1016 bits read. Storite 500GB 5400~7200 RPM High performance storage 3.5" SATA 3.0 Gb/s Internal Desktop Hard Drive for PC/Apple/MAC/CCTV/NAS/RAID/DATABANKS for PS4 & X-Box WD HGST SGT Toshiba Samsung etc.